Niche line Bond no. 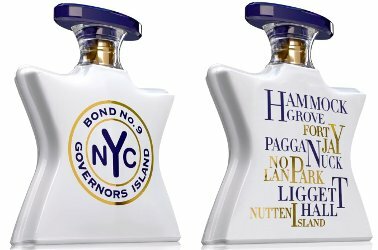 9 has launched Governors Island, a new unisex fragrance. Hypnotic, seductive, addictive, this incense-filled scent at first seems at odds with an island famed for its recreational activities—its bike paths, its picnics, its kite-flying potential. But at Bond No. 9, we welcome this off-kilter dissonance--which is one important direction for fragrances (as well as for fashion) today. And besides, the deep, magical allure of Governors Island, the fragrance, actually invokes the smells of the island's dense woodlands. All in all, it's a rule-breaking symphony of tenacious forest notes—the kind that are typically used in drydowns. But here, they constitute the entire composition, starting with warm, concentrated resin incense. This soon segues into a heart of dark, honeyed ambrox (simulating ambergris) and dry, tobacco-like cedarwood, creating a halo-like glow. The base notes? Animal-like white musk, combined with muscenone (a booster musk), and a soft, feminine version of that crisp tropical grass, vetiver. While the sum total may at first present itself as a male fragrance, which men assuredly will love, we can guarantee—women will also adore this hypnotic brew and claim it as their own. Bond no. 9 Governors Island is available now at Saks, in 100 ml Eau de Parfum, $350. At first I was only going to say that I like the bottle. After reading “kite flying potential” though, I had to laugh. I would really like to know for sure if I can fly a kite or not, before I make the trip. ???? Seems like a bad start when the brand feels it has to justify the fragrance notes in the marketing copy. They do overwork the unisex angle a bit! While it sounds lovely, there are several other perfumes that evoke resins and forest that are far less expensive.